Bottle, 330ml. First released in November 2015. 33 cl bottle @ home. Pours clear golden with a white head that leaves a little lacing. Aroma and flavour are tropical fruit, candy sugar, and flowers - with a slightly bitter finish. Draught) @ Brew By Numbers Brewery, 79 Enid Street, Bermondsey, Greater London, England SE16 3RA. 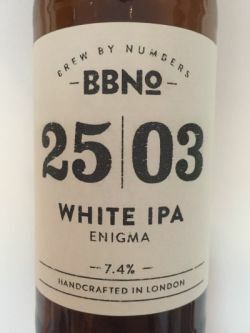 [ As Brew By Numbers 25/03 White IPA - Enigma ]. Bottle at home. Pours golden, nose is orange, grapefruit, toffee, taste is pithy citrus, juicy, sweet. Pretty good considering how long I’ve had it! Keg at Tapped. Leeds jaunt. Pours clear golden with a thin white head. Aromas of passionfruit, grapefruit. Taste is bitter. Sharp, zingy finish. Bottle from BottleDog Edinburgh. Pours slightly hazy golden. Nose is citrus, grass, orange, light spices. Tastes fruits, citrus hops, medium sweet, orange, light earthiness, light spices, grapefruit. Tasty stuff. 330ml bottle from Brewdog online store. Hazy yellow amber colour, white foam head and aroma of passionfruit, mango, citrus, hop resins. Taste is malt caramel with juicy tropical fruits, citrus, orange & grapefruit, pine, hoppy and dusty earthy bitterness. Creamy mouthfeel, light to medium bodied, soft carbonation, dry tangy spicy bitter finish. Very drinkable IPA. Keg at the brewery. Hazy gold - amber beer, tidy pale cream colour head. Palate is light and has a mild crispness. Light and semi sweet malts, thin cream. Mild hop skunk. Seltzer. Dank and resinous tropical fruits. Finishes semi dry. Nice. Keg at the brewery. Translucent orange golden coloured pour with a fluffy off white head. Aroma is pithy lemon, orange rind, white bread and wheat. Flavour is composed of light doughy bready grains, pithy citrus, spicy citrus rind, wheat. Palate is semi sweet doughy grains. Moderate carbonation. I like it.